In mid-1999, an ex-RCN Sparker passed away. In his files, his widow found this historical message and donated it to the SPARC Radio Museum. After attacking the Bismarck for an hour and a half, Admiral Tovey ordered his gun crews to cease firing. All of Bismarck's guns had been destroyed in the ensuing battle, however the ship refused to sink. The British Admiral set a course for home and ordered HMS Dorsetshire to sink Bismarck with torpedoes. The cruiser fired a torpedo into each side of the burning target, which finally sank minutes later. 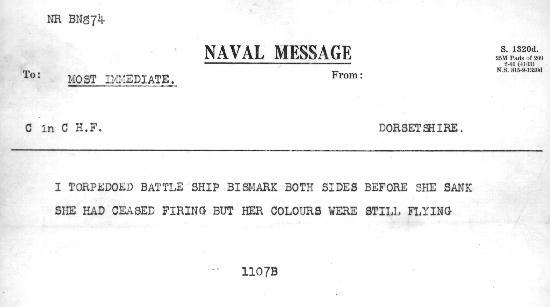 This was the radio message sent by Dorsetshire after that action.